In September, TechnoBuffalo brought you a report on WebOS 2.0 being released to VIP developers. "The best news always comes earlier in the week and it looks like Palm took Tuesday to amp up developers and fans of WebOS, announcing the WebOS 2.0 software development kit (SDK) to become available today for Early Access Developers. There's plenty of changes in store for the OS when it launches later this year but here are the few Palm is eager to share." Finally, it's here and TechnoBuffalo's got you covered from bottom to top. 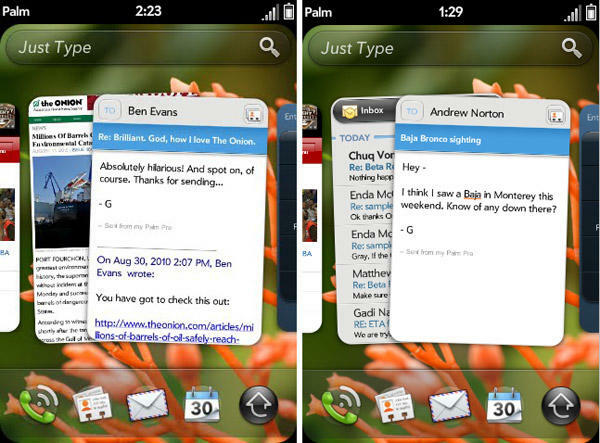 Does the new WebOS 2.0 fill in the missing gaps and raise the bar on features from WebOS 1.0? Jon Rettinger will go through all of that and more in this full walk-through on the Palm Pre 2. What do you think? Do you agree? Disagree? Sound off and leave a comment below! Easily the best multitasking implementation on a smartphone today, Palm's looking to up the ante on it's card multitasking metaphor by grouping related cards in stacks to reduce clutter and making your workflow much, much smoother. The stacking will be automatic but users can drag and drop cards as they see fit to manage their own workflow. For example, when you're browsing your email and you want to add an event invitation to your calendar, the link will open your calendar, keeping both your email and calendar in one stack as you change between apps. This will be killer for WebOS tablets. It seems everyone's doing Universal Search nowadays and Palm's looking to take it a step further with Just Type. You can start an email, create a message, update your status, search a webpage, and more without launching an app. Developers can hook their apps into Just Type that'll enable users to search within that app or even defining their own quick actions to speed up what the user wants to do. Expanding on the wireless charger, Palm's opening APIs that allow developers to trigger the execution of an action just by placing the WebOS device on the Touchstone charging dock. Stocks, news, sports tickers, social network updates, alarm clocks are only the beginning and it's up to developers to add Exhibition support to their new or existing applications. Palm's opening up Synergy to developers, allowing users to pull information into their phone to be stored locally. Synergy connectors for contacts, calendars, messaging, and IM clients can converge seamlessly like the Facebook implementation found in WebOS 1.0.